In 1902, Frances (Fannie) Griscom Parsons, with support from the local parks and school departments, founded the DeWitt Clinton Farm School at the corner of Eleventh Avenue and Fifty-Third Street (in the “Hell’s Kitchen” neighborhood on Manhattan in New York City). The plot, situated on a former dumping ground and truck storage facility, was just a stone’s throw from the Hudson River. The farm school project had been green-lighted by authorities as an interim activity prior to transforming the parcel into a city park. In its first year, an area measuring 114 ft. by 84 ft. was tilled by 25 children from surrounding tenements. They labored under the supervision of city parks department gardeners – mostly Swedish immigrants with gardening experience from their homeland. In the second year of the project, the garden space grew to 200 ft. by 100 ft. and was tended by 277 children. Eventually, a smaller garden was incorporated into the park’s final design. The DeWitt Clinton Farm School quickly became a model for how to garden in a dense urban setting. It consisted of grids of beds that could efficiently be assigned to individuals or classes. Pigs were also raised by the children. A small building on-site served as a “farmhouse” where children could act out being the host and hostess of the farm. The space was surrounded by a three-foot high fence, on which inquiring adults leaned to watch the busy goings-on in the garden. The school garden movement gained momentum in the early years of the twentieth century. In many cases, gardens were started and supported by women’s clubs, mothers’ associations, horticultural clubs and other civic groups. Their collective efforts resulted in a national movement that was joined by universities, private institutions and municipal agencies. Here are two shining examples of those early, far-reaching school garden initiatives. In 1910, the School Garden Association of America was founded to promote school gardens as an important part of the country’s educational system. It sought to encourage the establishment of school gardens, conduct experiments, and arouse the public’s interest. By 1912, it boasted a membership of 2000 principals, teachers and citizens. The International Children’s School Farm League grew directly out of success of the Dewitt Clinton Farm School project. It sought to encourage a world-wide interest in children’s gardens. 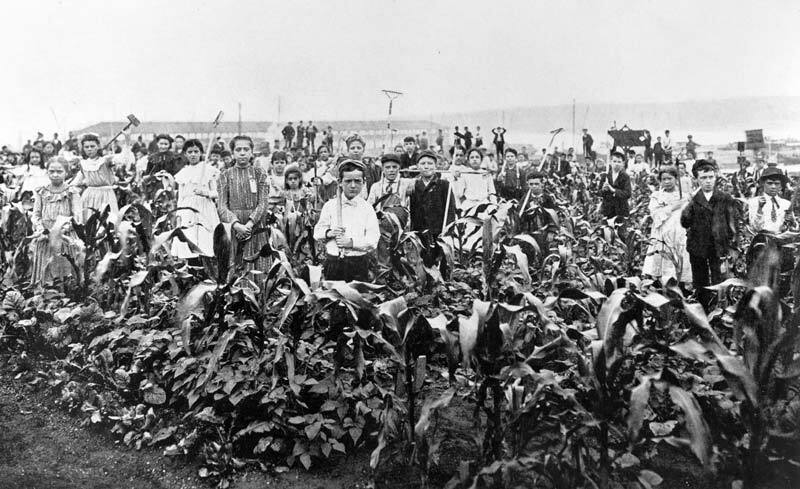 The initial project was a demonstration garden, modeled on the farm school on Manhattan, for the 1907 Jamestown Exhibit. Its members gave lectures and offered displays at conferences around the country. Most children’s gardens relied on financial support and personnel from philanthropic institutions, even as some supporters advocated strongly for the public school system to integrate gardening into the educational system. In 1914, the U.S. Bureau of Education established the Office of School and Home Gardening. Three staff members were assigned to the agency. They assisted local school boards with publications and other promotions. In 1916, the agency published a bulletin, Gardening in Elementary Schools. The bulletin spelled out the many reasons to garden, offered suggestions for how to start and fund a school garden, and urged financial support on the part of local school boards. As an example, the bulletin estimated that for every one dollar invested in employing a gardening instructor, twenty dollars worth of produce was produced. A 1918 report by the Detroit Bureau of Governmental Research illustrated the challenge of balancing public and private support for school gardens. Until 1913, the city’s school garden program had existed under the sole leadership of the Twentieth Century Club, a private entity. That year, the board of education began to provide support, but in 1915, responsibility for school gardens was transferred to the municipal recreation department. The 1918 report was critical of the recreation department’s supervision, citing funds that were allocated for training garden leaders but not spent as well as other problems. It argued that since gardening had been proven to offer tangible civic and educational benefits (similar to kindergartens), school gardens should be the responsibility of the board of education. “It is because school-gardens have from the start been conducted as a legitimate part of free public education in Philadelphia that the pride and interest in them have been so widespread and immediate” (Public Education Association of Philadelphia, Twenty-Fourth Annual Report, 1905). Another example of close cooperation between multiple entities occurred in Washington D.C. The U.S. Department of Agriculture provided support for school gardens in 1904 in the form of a 1/16-acre site on department grounds, together with a small greenhouse and workroom. Sixth grade White boys were trained at the site, while girls were trained in sewing. Produce raised in the garden was donated to area hospitals. The following year, the USDA provided a greenhouse for African American pupils at another of the district’s segregated public schools. Students who received training in the greenhouse then taught other students. Soon, every African American school in the district with enough space had a school garden. By 1910, Washington schools had four large school gardens on vacant lots in addition to school grounds improvements at 100 White and African American schools. That year, the U.S. Congress also approved money for gardening supplies (but not salaries for instructors) for the district. Even so, a Supervisor of Nature and School Gardens position was created (with the salary paid for by outside sources). She collaborated with the USDA to produce articles and pamphlets that supported the development of the growing national school garden movement. Next edition: California here we come!